I have been studying happiness for a while. My motivation for focusing on and exploring happiness was being deeply and seemingly chronically unhappy. It’s hard to admit you’ve been unhappy for an extended period of time, but what that admission allowed me to do was to take a clear step into the landscape of happiness to see what I might find. Happiness is not something we choose entirely, we don’t have full control over the happiness we experience in our lives. But we do get to do some choosing, often quite a lot, and this is important. Happiness is a co-created experience. We are influenced by our environment – what’s happening to us and to those we love, what other people are doing and how that impacts us. It is just nonsense to say that our environment has zero impact on our happiness and no matter what’s going on, we can be deliriously happy. Try telling that to someone who has had a loved one diagnosed with a debilitating disease or someone who has just lost their job. But, and this is very important, it IS possible to think and feel about those experiences in such a way that our levels of happiness are improved. 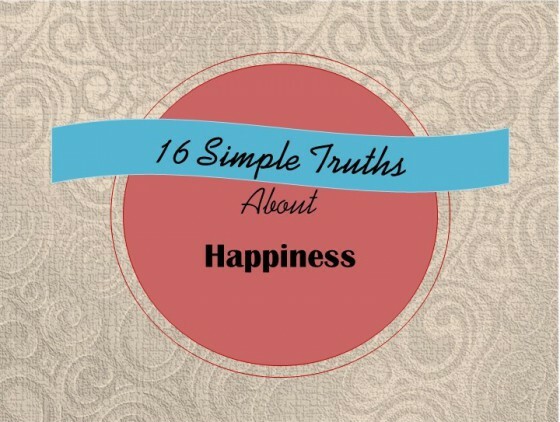 Experiencing happiness on some kind of consistent basis is the birthright of all of us. I believe this is how it was intended to be – that humans lived in a state of consistent happiness. Of course, the reality that many people find themselves in is so different from that ideal. But it’s important to acknowledge and recognise that we are meant to be happy – this is our natural state, our birthright. Happiness is a combination of what gives our lives meaning and what gives our life pleasure. This definition of happiness, which I found in the work of Tal Ben-Shahar, is the very best definition I have found, and can be universally applied to anyone in any situation. The problem many people have with happiness is thinking it is all about experiencing pleasure, all the time. Sure, having pleasurable experiences and feeling pleasure is one aspect of being happy. But it’s not the full story. Meaning is a significant part of experiencing happiness. Meaning can come in many forms including the work you do and the contribution you make, having something of value to do with your time and talents, loving other people unconditionally, feeling your work makes a difference, believing what you do is important (even if just to one other person), and leaving a legacy. Hope is a part of being happy, too. Having something to hope for, feeling that life is worth living beyond today, believing the future won’t be all bad and possibly be a lot good. Without hope, there is bleakness, desolation, darkness, emptiness. Without hope, happiness is not possible. How you treat yourself has a lot to do with the happiness you experience. Are you kind to yourself? Are you generous? Or are you harsh and judgemental? The greater degree of self-kindness and self-care, the great the amount of happiness you have in your life. Stress and worry are a modern plague and account for (some studies say) up to 90% of all visits to GPs. It’s hard, if not impossible, to be happy when you’re worried and stressed all the time. The anti-dote in its simplest form is to create a life where there is less worry and stress all the time. And to proactively stop worrying about all the useless, meaningless, unimportant crap that really makes no difference at all. What you think and how you feel are a huge component of the happiness you experience. It’s nigh on impossible to feel happy if you are thinking miserable thoughts. As you think, so do you feel. If you are thinking thoughts about what’s missing from your life, what you haven’t achieved, what you’re disappointed about, what you believe you are missing out on, who’s doing better than you and other such thoughts, – then you will feel all the emotions that go with that including disappointment, failure, frustration, loss, envy. And if you are thinking thoughts about all the wonderful and wondrous things in your life such as what you have achieved, the people you have around me, the experiences you get to enjoy, the places you have been, all that is surrounding you in this very moment – then you will feel all the emotions that go with that including gratitude, connection, hope, joy, wonder. Even if you can’t feel blissfully happy, you can increase your levels of happiness at any point in time. I call this ‘leaning into happiness’ – it’s a direction you choose to look toward. Being unhappy isn’t bad or wrong, but it can be a habit we get into. And like any habit, it can be changed. Even if you’ve been unhappy for a long time, you can start to move in the direction of being happier. If you want to. Happiness is not an accomplishment. It is not a place you arrive at. There are so many messages – in the media, in the work of self-proclaimed success gurus, online everywhere we look – who will tell us the opposite. That there is a secret formula to achieving happiness, and it goes something like this: If we strive, if we struggle, if we stretch, strain and scramble… we’ll succeed. And then we’ll be happy. Not so. You can be happier right now, in this moment right now. No success guru or happiness blueprint required. Being happier is not only possible in this instant, but it’s also free. You don’t have to pay anything, to buy anything, to acquire anything more, to be happier. Happiness is most definitely a perspective. It is something we choose to see, in the landscape we are surrounded by. We have a choice in what we focus our eyes (and our hearts and minds on). What we choose to see, what perspective we choose to take, influences our levels of happiness. Happiness is the ultimate currency. Better than traditional measures of success, money, prestige, power – happiness cuts through the extraneous and goes to the heart of the matter. and get your free assessment: Are You Addicted to Shopping?